HTC has finally announced its latest 10-inch tablet, the HTC Jetstream, a new 10.1-inch Android Honeycomb tablet that will launch exclusively with AT&T on September 6. 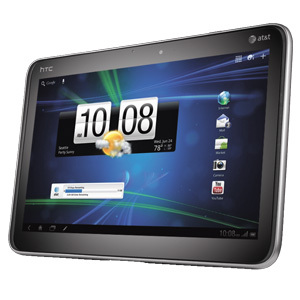 The tablet is the first tablet to run Android 3.1, Google’s latest version of the tablet-specific Honeycomb firmware, after Google stopped the release of the previous version due to code issues and an admission it wasn’t ready to market. That aside, the device features a 10.1″ WXGA high-resolution display, dual-core 1.5 GHz Snapdragon processor and an 8MP rear-facing camera and 1.3MP front-facing snapper. HTC has also made available its HTC Sense user interface, which is likely to have received a fresh update to play nicely with Google’s latest Honeycomb release. On September 4, the tablet will be available exclusively to AT&T customers online and in company-owned retail stores – two days before general release – for $699.99 with a new two-year contract. For a limited time will also be able to claim a free HTC Scribe digital pen accessory. Read next: US Government files to block merger of AT&T and T-Mobile, FCC has "serious concerns"